They say a mother’s love knows no bounds. She gives so much to her children and family every single day. This year Mother’s Day falls on 12 May 2013, which is when children and fathers all over the world will be taking the time to show the mothers in their lives just how wonderful they are. Mother’s Day was started way back in 1908 by Anna Jarvis and the tradition has become a part of our lives ever since. People choose to celebrate this day in different ways. Flowers and a card are the traditional option while other mothers can’t think of anything better than a day of pampering at the spa. But what better way to show your appreciation than with quality family time. Spending time with your family is the best way to build memories. Taking your mother out for the day gives her time to bond with the special people in her life while you take the time to shower her with love. A family meal at a nice location tends to be the preferred option for families and moms alike. 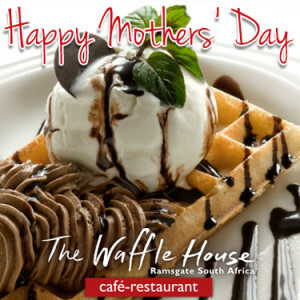 Head over to The Waffle House this Mother’s Day. The relaxed scenery and good food make for the ideal location for some family fun and laughs. Use 12 May 2013 to give something back to your mom. She deserves it.